Waterton Canyon is a gentle dirt road following the South Platte River approximately 6.5 miles to Strontia Springs Dam. Cars are not allowed except for authorized vehicles and is a favorite for Biking, Hiking, Horses, fishing, and picnics. The Trail head of The Colorado trail is also located just beyond the Dam. Follow Wadsworth Blvd (Highway 121) south of C470 past Chatfield Reservoir. Turn left on Waterton Road. Take second entrance to the parking lot on the left. Dogs are not allowed on the Canyon trails, for the protection of the bighorn sheep. Stream Fishing: The fishery is managed by the Colorado Parks and Wildlife. Bait may be used in river from above (upstream of) Kassler to the Marston Diversion Dam. Artificial flies and lures only, above Marston Dam. Lake Fishing: Strontia Springs has a bag limit of two trout 16 inches or longer. Note: The lake is difficult to access from the Bear Creek Trail above Waterton or at the South Platte. Handicapped Accessible Fishing Pier: A handicapped accessible fishing pier has opened a mile and a quarter up Waterton Canyon. The site was chosen for its mountain canyon stream location and its access to fish habitat structures in the river. Handicapped persons have priority use of the pier. 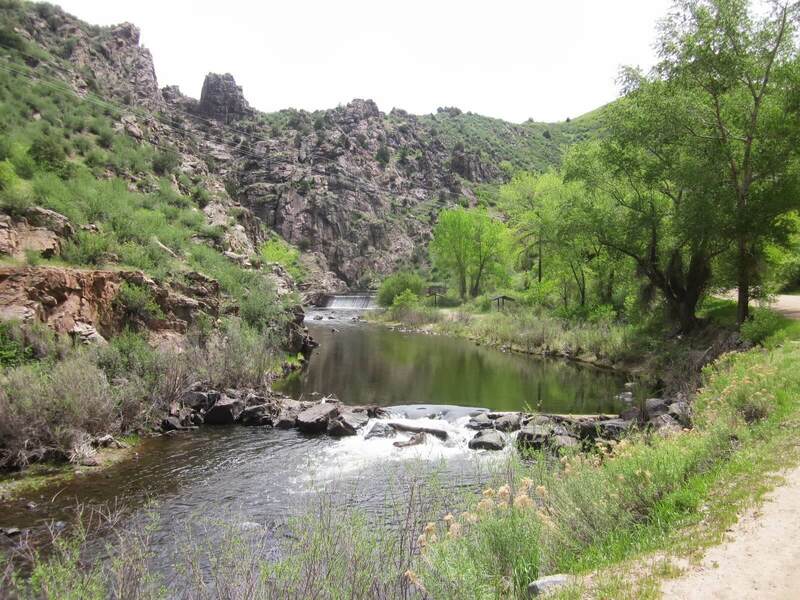 Waterton Canyon offers a 6.5 mile hike to Strontia Springs Dam. The Colorado Trail continues above the lake approximately 10 miles to the confluence of the North Fork of the South Platte and the South Platte River. The Colorado Trail continues to Durango. Waterton also connects to the Roxborough State Park trail system. Note: Camping is allowed on the Colorado Trail, but not in Waterton Canyon. Hikers must proceed past Strontia Springs before camping. Dogs are not allowed on the canyon trails, for protection of the bighorn sheep. Waterton Canyon connects to two riding systems; Chatfield State Parks trail system and the U.S. Forest Service Indian Creek trail system. Trailer parking is provided both at Waterton parking and at the Discovery Pavilion. Wildlife viewing: Bighorn sheep and mule deer are often seen in Waterton Canyon. Waterton also hosts more than 40 species of birds. Picnic tables are provided in several areas. Sheltered tables also available. Note: Water contact sports such as swimming, wading, scuba diving or other water activities are prohibited. Chad Bergman is a Roxborough Resident since 2002 and the administrator of RoxboroughLiving.com. He's a supporter of many organization in the area and works in the marketplace.